The tiny brown, black or white seeds of the sesame plant add crunch and flavor to crackers, breads, cereals and even candy. But sesame seeds don't just taste good; they're good for you.. Toasting sesame seeds enhances their flavor. Grinding the seeds helps your body absorb more of their nutrients. Because of their high oil content, sesame seeds can turn rancid. Store them in a cool, dark place or the refrigerator to maintain their quality and flavor. Omega-3 fatty acids are polyunsaturated fatty acids, also known as PUFAs, that your body needs but cannot make itself. Omega-3 fatty acids help reduce bad cholesterol, lower blood pressure and improve cognitive function. Fish contain the highest amounts of omega-3, but seeds and nuts, including sesame seeds, are also good sources of this nutrient. The U.S. Department of Agriculture recommends you consume between 7 and 11 g of omega-3 fatty acids each week. 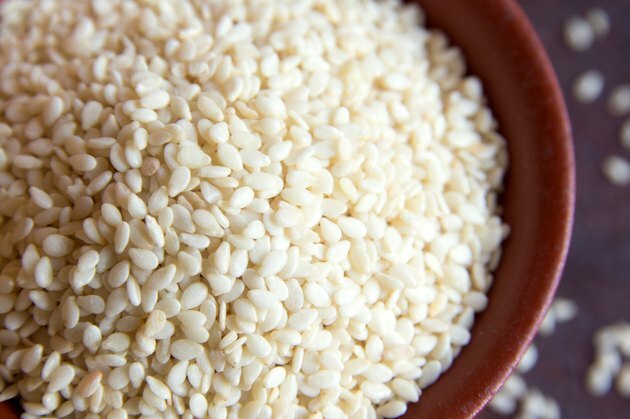 An ounce of sesame seeds contains 0.1 g omega-3. One ounce of sesame seeds is equal to about 3 tbsp. You could sprinkle the seeds into cereal or casseroles, add them to smoothies or soup or crunch them in traditional sesame seed candies. Ground sesame seeds form a paste called tahini, used in oriental cooking. Sesame seeds contain the compounds sesamin and sesamolin, which may help lower blood pressure and protect the liver. The fiber in sesame can help prevent constipation. Sesame seeds are a good source of vitamin E. They also contain vitamin B1, iron, magnesium and other minerals. It would be difficult to consume enough sesame seeds to meet the dietary requirements of omega-3, but they can make up one part of your diet. Fish, walnuts, flaxseeds and vegetable oils are other good sources of omega-3. Four ounces of canned salmon provide 2.2 g omega-3. An ounce of walnuts adds another 2.6 g and a tablespoon of canola oil provides 1.3 g.